Clare brings to H&W significant experience in telecommunication site acquisition, spectrum and regulation issues. Prior to joining H&W, Clare represented a large nationwide carrier in negotiating real estate and telecom leases, petitioning for zoning and permitting authorizations and securing National Environmental Policy Act, National Historic Preservation Act and other regulatory approvals for new wireless site builds. 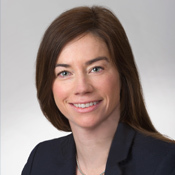 Clare has also served as Vice President for a start-up wireless company where she focused on spectrum acquisition and licensing compliance in the 2.5 GHz band and participated in the Federal Communications Commission’s rulemaking proceedings and the Broadband Technology Opportunities Program. In her free time, Clare enjoys boating, hiking and watching the Caps and Formula One.